The Ruger PC Carbine is an excellent rifle for shooters looking to get into Pistol Caliber Carbines. The Leupold LCO Red Dot pairs great with this rifle. Pistol caliber carbines have been making quite the resurgence these days, and Ruger is eager to join the fray. Seems like every specialized AR-15 shop is making a 9mm AR, and more and more of the big guys are even getting into the “PCC” craze these days. Ruger is the latest to enter the pistol caliber carbine market with their Ruger PC. Ruger has been innovating a lot these days with all sorts of excellent firearms and the Ruger PC in 9mm is no exception. The Ruger PC Carbine is modeled after the Ruger 10/22 Takedown. This 9mm carbine will accept Ruger SR9 mags or Glock mags, has iron sights and a Picatinny rail for optics, and has a threaded barrel for a suppressor or muzzle device. The magazine compatibility makes this carbine an excellent companion PCC for Ruger SR9 owners or Glock 9mm owners. 9mm doesn’t have nearly the same range as centerfire rifle calibers such as .223 or 7.62×39, so why get a pistol caliber carbine like the Ruger PC Carbine? There are quite a few reasons to get a pistol caliber carbine. For many people, the primary reason is cost. 9mm ammo is cheaper than most centerfire rifle ammo, so a pistol caliber carbine will pay for itself rather quickly in training ammo when compared to centerfire rifle ammo costs. PCCs can also be shot at many indoor ranges where centerfire rifle calibers are not. 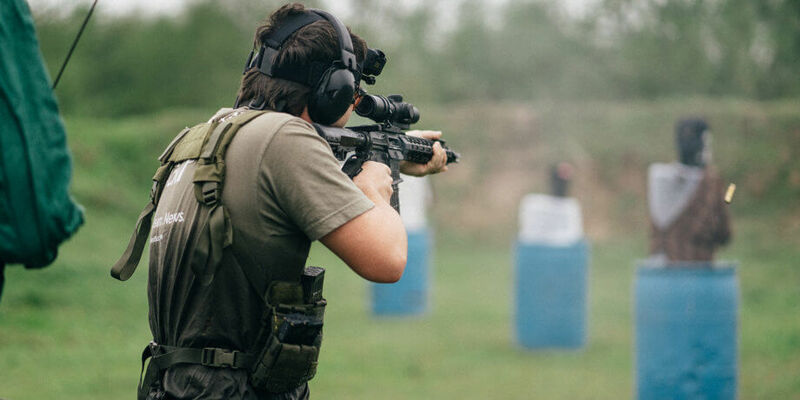 One of the other common reasons for a pistol caliber carbines is for shooting competitions, such as USPSA’s PCC division. The Ruger PC Carbine would be a great gun for shooters looking to get into PCC shooting competition formats. Centerfire rifle calibers have a number of safety concerns when shooting steel targets up close, making the close distance action shooting competition format difficult for rifles. 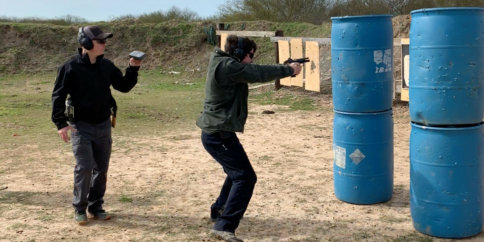 Pistol caliber carbines allow shooters to safely engage targets in a USPSA or action pistol style shooting competition format. 9mm Carbines tend to offer a more pleasant shooting experience than most centerfire rifle calibers. 9mm has minimal recoil, very controllable muzzle flip, much less of a concussive blast, and is all around a very controllable caliber in a rifle. This makes The Ruger PC Carbine a great rifle for new shooters and even experienced shooters looking to hone their rifle skills. If you’ve never shot a pistol caliber carbine, you should. They’re just pure fun. Due to the weight, size, and ammo choices, 9mm carbines such as the Ruger PC also make for excelent home defense weapons. Speed, accuracy, and excellent handling make rifles an excellent choice for defending against intruders. The primary purpose of having a takedown rifle is transportation and storage. The Ruger PC Carbine breaks down into an incredibly compact package, easily shoved into a small bag or even a backpack. For firearms enthusiasts who live in the city, sticking a rifle and a handgun along with some ammo in a backpack could make range trips more discrete than lugging out big rifle cases plastered in #2a stickers. The Leupold LCO Red Dot is a fullsize large window red dot intended for carbines shooting at targets up close and personal, ideal for pistol caliber carbines like the Ruger PC in 9mm. The large window and bright 1MOA red dot makes fast target acquisition a breeze, as well as precise shots in carbine distances. A durable red dot from Leupold. Great setup but at $1200 with PC and Leopold ? Any place that sells both setup and ready to ship. As the PC is a takedown , do the optics stay or have to be resighted at each reassembly? Maybe get a larger foam filled case…. Optics stay and do not need to be resighted. Ruger Takedown assembly is very accurate and consistent.